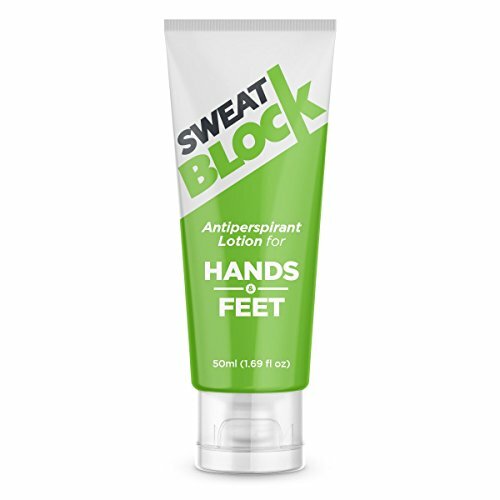  STOP HAND SWEAT & SMELLY FEET: Shake and hold hands with confidence. Effective foot odor reduction. Hand antiperspirant perfect for hand hyperhidrosis and excessive hand sweating. 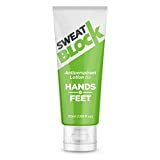 SWEAT LESS, LIVE MORE: Foot and hand antiperspirant lotion for you, professionals, gamers, climbers & athletes. Will help with sweat prevention and foot odor reduction! "NO SWEAT" CONFIDENCE: Proven formula to reduce palmar & plantar hyperhidrosis & excessive sweating. Our goal is for you to have confidence in your biggest moments.  SAFE, STRONG & PROVEN: The best FDA compliant antiperspirant made in USA for foot & hand sweat. No need for anxiety: our lotion helps you worry less and gives you peace of mind to avoid the embarrassment of sweaty hands or feet. LOVE IT, OR IT'S FREE: Don't sweat it, just contact us! 30-day money back "Sweat Block" guarantee.